Frederico Fellini’s craft first took root in Italian Neorealism, characterized by the stark poverty of the country post World War II. The filmmaker evolved with the rapid changes in his society, however, and moved on to develop an otherworldly vision punctuated through his films of the later 1960s. This emerging transition commenced with Nights of Cabiria (1957) and came to full fruition with La Dolce Vita (1960), alongside the shifting economic conditions of the 1950’s that posed both prosperity and a confusion of values to Italian society. In both films the driving force of escape from a world of spiritual and emotional destitution is love, though abstracted or unattainable. They exemplify the ubiquitous beauty that towers over Fellini’s filmmaking even in the most squalid of circumstances, and the evolution of a visual language entirely unique. In Nights of Cabiria the title heroine, played by Fellini’s wife and muse Giulietta Masina, inhabits the outskirt slums of Rome working her trade as a streetwalker. While she struggles to keep pace with the burgeoning high society of the city, class disparity affords the film a stylistic departure into the metaphysical. Aristocrats seem as denizens of another plane, nightclub showgirls reveal new chapters with ritualistic dances, and movie star mansions display menageries of toucans. Cabiria explores Rome’s various strata maintaining a steadfast piety and an ardent desire for love in a landscape all but futile. The pace spirals yet further when she stumbles upon a magic show, a device Fellini would later revisit in 8 ½, drawing the character into an altered state and reality of new possibilities. Masina too evolves from a roughly hewn Chaplin-esque style to a naturalistic depth that drives the narrative with gripping pathos as she searches for redemption in a fantasy world wrought with deceit and ridicule. The film’s superiority in every aspect earn it a place of high prestige in Fellini’s canon. Pier Paolo Pasolini, known for his familiarity with the seedier sides of Rome, was recruited to collaborate on the screenplay. Despite the controversial subject matter, Masina was awarded Best Actress at Cannes. The film’s novel approach at narrative and cinematic innovations wonNights of Cabiria the Oscar for Best Foreign Language Film. Pasolini said of Fellini’s vanguard style: “The camera moves and fixes the image in such a way as to create a sort of diaphragm around each object, thus making the object’s relationship to the world appear as irrational and magical.” Fellini’s potent methodology and command of beauty would come to navigate his most highly regarded film, La Dolce Vita. The plot centers around journalist Marcello Rubini (Marcello Mastioranni). He too struggles between the realities of his professional life of observing a social class by which he is ultimately alienated, despite the highbrow coterie of friends and lovers it affords. Alongside his literary aspirations and intellectual friends, his work seems paltry and obnoxious – the film coining the term “paparazzi” with its character Paparazzo, an intrusive photographer in Marcello’s employ. La Dolce Vita is divided into seven chapters assigned to seven consecutive days of Marcello’s life amid his illustrious circle played by a legendary cast. Yvonne Furneaux is Marcello’s suicidal fiancée neglected by his penchant for lavish escapism. Anouk Aimee plays his primary mistress, a jaded heiress with a gothic misanthropy and wardrobe to match. Alain Cuny co-stars in the role of Steiner, the intellectual whom Marcello admires for his literary success and prowess, but who harbors a secret misery. Anita Eckberg plays the iconic Sylvia, the ultimate bombshell of an American film star. Radiant and dim, she appears to relish in the attention Marcello despises and feebly maintains a histrionic joie de vivre, culminating in the famous scene where she basks with Mastioranni fully clothed in the Trevi Fountain. For all their extravagance, each of the characters in La Dolce Vita conceals a desperate frustration beneath their polished exterior. They yearn for something intangible, undefined, or ineffable as conveyed by the film’s recurrent theme of the miraculous and bizarre. 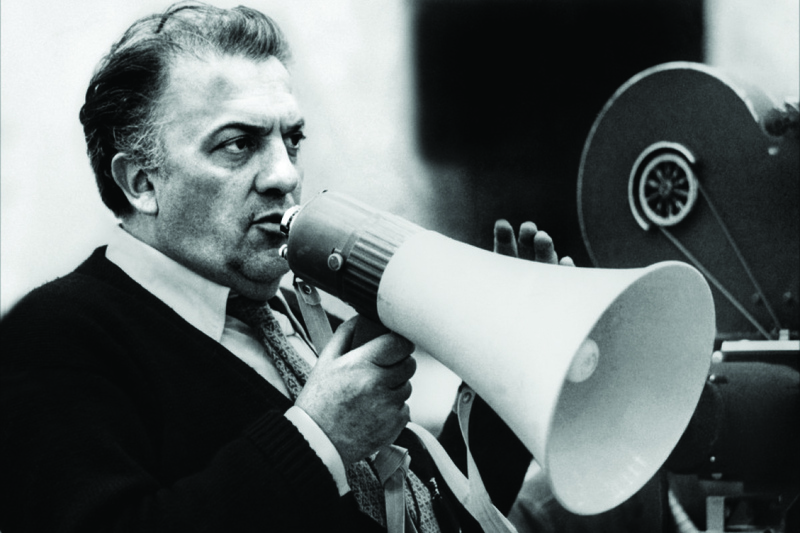 Chief among the qualities defining Fellini as a great artist is the scope of totality that his work encompasses. Though sardonic, incisive and prescient; both films are too transcendental to espouse mere social commentary. Their essence is too radiant to evince tragedy, and too blissful to embrace futility. Fellini’s stylistic departure from the neorealist to the mythological was one of necessity rather than aesthetics. His films put forth a vision of life so broad – and yet acutely individual – as to examine the nature of struggle, corruption, spirituality, beauty, and art itself. They portray a perception of existence that is, for all its pain and complexity, an elegant expression of the sublime.